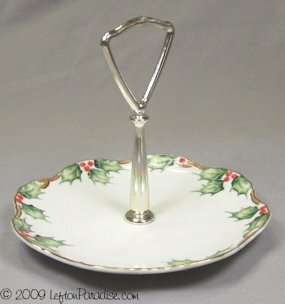 Holly Garland Single Tidbit Dish, NE2094 - Lefton Discounts Apply ! A sweet little tidbit dish with a gold tone handle. The pattern is Holly Garland from the late 50s, with a Lefton color crown mark on the bottom. The Lefton sticker is intact. It measures 6 inches wide and 5¼ inches tall. Item number NE2094. The dish has no chips or cracks.